The 2016-17 NHL season was packed full of surprises and more than its fair share of excitement. As a campaign which was defined by lethal rookies and the unforeseen success of numerous teams, the NHL’s most recent season proved once again why hockey is a tremendously popular and tantalizing sport. In the end, the Pittsburgh Penguins claimed the Stanley Cup and they certainly deserve immense praise for doing so. 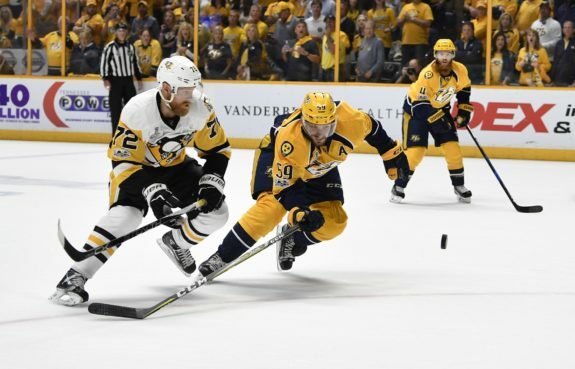 Not only were they forced to, once again, knock off their perennial rival in the Washington Capitals, but the ‘Pens were also tasked with dismantling the upstart Ottawa Senators and Nashville Predators on their way to a second consecutive championship. While the season has finally come to a close, the NHL calendar offers no opportunity for rest, as not only are the NHL Awards and Expansion Draft merely days away but so too is the annual NHL Entry Draft. It goes without saying that the NHL Draft is one of the most exciting times of the year. With a wealth of young, raw talent poised to enter the league, a franchise’s future has the ability to change drastically through the addition of just one player. In 2017, Nolan Patrick and Nico Hischier will lead the way, with both retaining the ability to improve a given club in the blink of an eye. Outside of these two budding stars, tons of other eligible players wait eagerly to hear their names called. Given the 2017 draft class’ incredible variety in terms of position, skill, and potential, the quickly approaching event projects to be one for the ages and especially so given the impending arrival of the Vegas Golden Knights. So, with an immense amount of change in the rankings over the past few months, let’s take a quick look at three top prospects who rose dramatically as well as three players who stumbled heavily to close out the hockey season. Cody Glass’ march up this year’s draft ranking was both swift and substantial. Despite beginning the 2016-17 season as a likely late first to early second round pick, Glass quietly slid into the top-five overall in the final ranking. So, how did Glass enjoy such an incredible rise, you ask? Well, let’s begin with Glass’ offensive production. 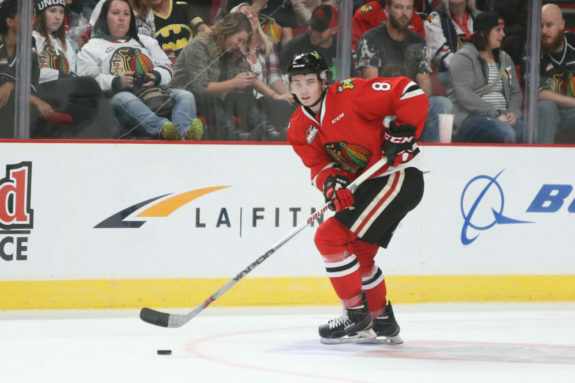 In his second season of play with the Portland Winterhawks of the WHL, Glass increased his overall point total by 67, while he also netted 22 goals more than he did as a rookie. In fact, Glass was so lethal in his sophomore campaign that he finished the year in a tie for seventh in league scoring. Yet, perhaps what proved most valuable to Glass’ rise was the consistency and intelligence which he displayed on the ice. Known as a relentless competitor whose play rises to the occasion, Glass displayed the ability to quickly learn from his mistakes and use new information to his advantage. 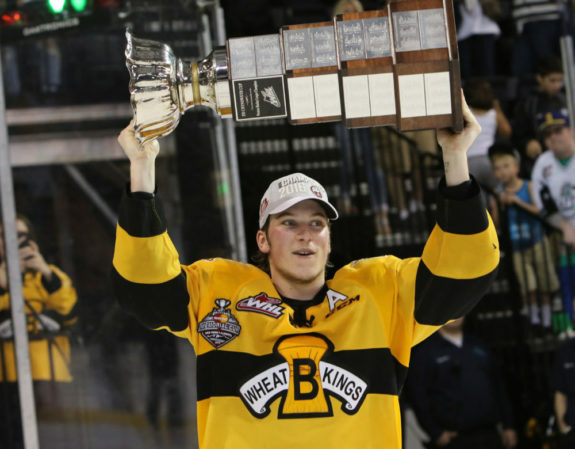 As a composed two-way centre with excellent patience, Glass’ decision-making and intense drive have combined to make him a player of immense potential at the NHL level. While he will need to further strengthen his game, Glass should continue to grow well into his 6’2″ frame – becoming increasingly dangerous and dominant as he does so. Like Glass, Cale Maker began the 2016-17 as somewhat of an unknown prospect. Playing in the Alberta Junior Hockey League, Makar’s talents were largely hidden from the public eye as his team received minuscule exposure. However, everything began to change for Makar when he captained Canada West at the U19 World Junior A Challenge. Scoring four goals and adding four assists in just four games played against the top competition in the nation, Maker quickly quieted any doubters who believed his game and potential had become falsely inflated playing against inferior competition. 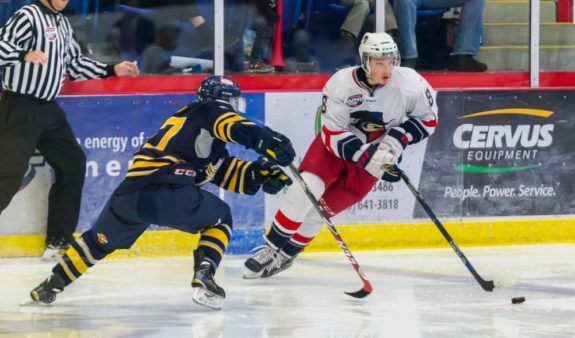 Upon his return to the Brooks Bandits, Makar continued to excel. In all, he wound up scoring 24 goals and 75 points in 54 games from the blue line, as his incredible mobility and innate offensive instincts made him a lethal and consistent threat for his team. Having drawn comparisons to Erik Karlsson of the Ottawa Senators, Makar’s calculated and intelligent transition game allows him to dominate his opposition at both ends of the ice. Of top-pairing potential, Makar should develop into an elite offensive blueliner at the NHL level. If his path to the draft has been any indication, Makar will surely continue to defy his critics as he pushes his way towards the professional ranks. Martin Necas is an interesting case. Playing for HC Kometa Brno of the Czech Republic League, Necas flew largely under the radar as he further developed and honed his game. However, the fact that he played alongside men as an 18-year-old and enjoyed notable success in doing so simply can not be overlooked. With regards to Necas’ individual game, the one aspect which immediately stands out is the Nove Mesto na Morave, Czech Republic, native’s drive and sky-high compete level. Never willing to give up on a play and capable of generating offence from seemingly nothing, Necas’s leadership and perpetual will to succeed has allowed him to thrive as his game has continually progressed. Further, Necas is incredibly confident in his abilities and will eagerly test himself against the best competition available. As a fantastic puck handler and composed playmaker, Necas loves to distribute the puck and, as such, collects a ton of assists. However, Necas can do much more than pass, as in addition to a quality shot the youngster is more than willing to drive hard to the net in search of rebounds or puck battles. However, the one factor which has, in fact, concerned a number of scouts to date is Necas’ size. While he stands well over six feet tall, Necas tips the scale at just under 170 pounds, making him one of the lighter players eligible in the 2017 Draft. Despite his lack of strength, Necas will have plenty of time to grow into his large frame, as he isn’t viewed as NHL ready at the moment. Regardless, Necas’ incredible potential simply can’t be ignored. Although he could take slightly longer to reach the NHL than others, his vast skill set and drive will ensure he is much more successful once he gets there. After beginning the 2016-17 campaign as a likely top-five selection, Owen Tippett has fallen off considerably in numerous draft rankings. 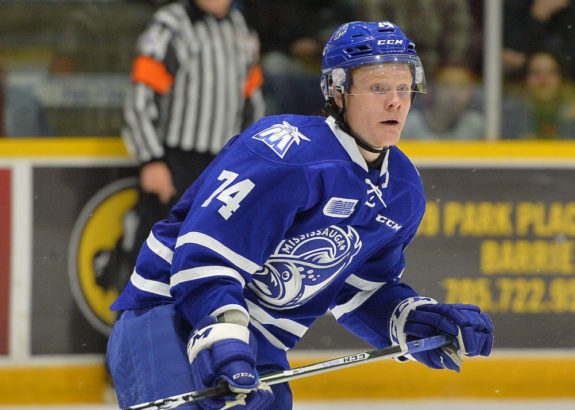 Now, don’t get me wrong – Tippett has amazing skill and could quite easily become an elite sniper at the NHL level. Further, of NHL size, Tippett blends blazing speed and raw strength into an extremely lethal style of play. However, Tippett’s game remains far from complete and is the major reason why he has slipped so significantly. Can you envision Phil Kessel but of greater size, strength, and the willingness to play a physical brand of hockey? Well, that is Tippett’s potential, however, like Kessel, Tippett’s game has struggled mightily away from the puck. Often awkwardly positioned and appearing uninterested defensively, Tippett needs to make a much greater commitment to his all-around game. While he can score in the blink of an eye, the Peterborough, Ontario, native can also be a distinct liability defensively. With this being said, I would be absolutely shocked to see Tippett selected lower than 15th overall, as his raw skill set will simply be too impressive to pass up. However, if Tippett is unable to refine his game and play an effective all-around style, he could find himself in the AHL for considerable periods of time. While I would vehemently agree that Michael Rasmussen is a solid prospect, I would have to disagree that he is top-ten or even top-five material. Maybe it’s just me, but I don’t see Rasmussen falling early in the first round given his particular skill set, respectively. 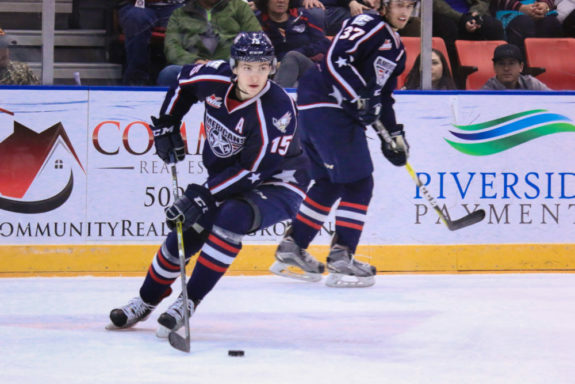 A big body, Rasmussen’s 6’5″ frame is extremely difficult to move from in front of the net and allows the Surrey, British Columbia, native to gobble up tons of juicy rebounds which lay in the crease. In addition, Rasmussen has soft hands in close and the ability to tip in shots from the points. On the other hand, Rasmussen’s game remains in need of substantial work. Given his size, Rasmussen is far from the best skater on the ice and will need to work on both his speed and agility in the near future – especially so if he wants to compete at the NHL level. Further, Rasmussen needs to become more than just a net-front presence. While he has solid playmaking skills and the ability to move the puck with ease, Rasmussen doesn’t possess an overpowering shot or elite handles with the puck. In the long-term, Rasmussen could certainly develop into a quality NHL player, however, he will need to become more of a multi-faceted threat before he can truly establish himself at hockey’s highest level. The 2016-17 QMJHL campaign was one which Maxime Comtois would surely like to forget. After wowing scouts in his rookie season – scoring 26 goals and 60 points – Comtois slumped to 22 goals and 51 points during a heavily scrutinized and stressful sophomore year. Comtois certainly has all of the tools necessary to become a dominant force at the NHL level, however, it would appear as though the Longeuil, Quebec, native has yet to piece together the puzzle which is his unique skill set. 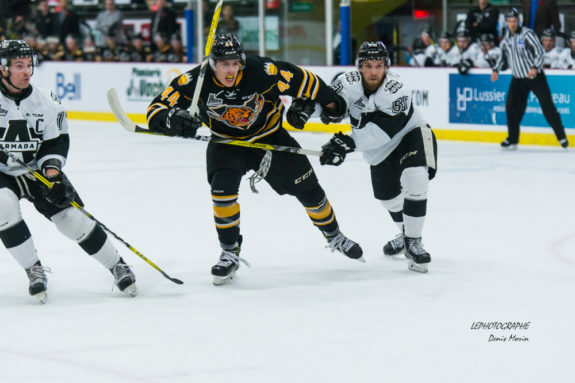 Of great size at 6’2″ and tipping the scale at over 200 pounds, Comtois is a strong, physical force who can protect the puck with relative ease. In addition to his physical capabilities, Comtois has a deceptive shot and one which has the ability to surprise opposing goaltenders. Further, Comtois sees the ice incredibly well and loves to pass the puck, as his composure and vision allows him to find teammates regardless of their position on the ice. Yet, regardless of his immense potential, Comtois has continued to fall in draft rankings due to his inability to improve and produce offensively. Yes, he has incredible raw talent, however, without the statistics to prove it, Comtois will be viewed as a potential depth forward rather than the top-six skater he has the ability to become. As such, the team which takes a chance on Comtois could grab the steal of the draft, as one poor season shouldn’t cloud the future of an incredibly talented young man. Now, it’s been a while since our last ranking, which came during March Madness. As such, many players have moved up and down within the final ranking given their strong performances, consistent production, or due to a complete lack thereof. So, having taken a quick look at a handful of prospects who have risen, as well as fallen, let’s dig right into the final 2017 NHL Draft Ranking of the season. Further, aside from the full ranking, be sure to learn about five particular picks which could draw an immense amount of attention on draft day.